A group of friends has been playing the same game of tag every May since childhood. This year is different. The buddies set out on a quest to tag their friend Jerry, who has never been tagged in all their years of playing. This will be their final opportunity to do so because, after this last month of play, Jerry is planning on retiring. We wondered how someone was going to make a movie based on a bunch of adults playing a schoolyard game, but truth be told, we've seen filmmakers build movies out of far less. "Tag" is directed by Jeff Tomsic. This is his first theatrically released feature film, though he has directed many television specials, episodes of various TV shows, as well as made-for-TV movies. The film is written by Mark Steilen and Rob McKittrick and is based on the Wall Street Journal article "It Takes Planning, Caution to Avoid Being 'It'" by Russell Adams. This story is about a group of lifelong friends who have been playing the same game of tag since elementary school. For Hogan (Ed Helms) and his friends, the month of May means open season on tagging the people he calls his closest pals. One day after securing a job as a janitor, Hogan shows up at his friend Bob's (Jon Hamm) workplace so he can tag him. This zaniness just so happens to interrupt an interview Bob is having with Wall Street Journal reporter Rebecca Crosby (Annabelle Wallis), who is doing a piece on Bob's company. Rebecca thinks her article on Bob's firm is too dull, so she quickly shifts her attention to the bickering adults in front of her as they strategize about how to continue their decades-long game of tag. 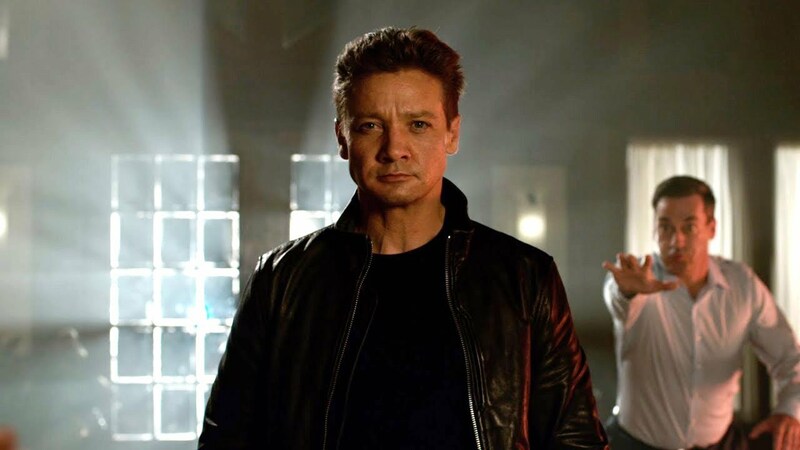 Her interest intensifies when she discovers their friend Jerry (Jeremy Renner), who has never been tagged, is going to retire from the game after this season. Hogan, Hogan's wife Anna (Isla Fisher), and Bob pick up their two other friends Kevin Sable (Hannibal Buress) and Chilli (Jake Johnson) to join forces in a quest to finally tag Jerry while Rebecca documents it all. We were very apprehensive about this movie. A friend of ours told us about the concept for it, and we genuinely thought he was joking. 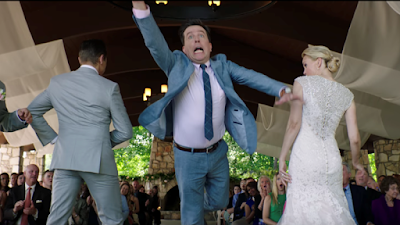 We wondered how making a movie about adults playing tag would work on any conceivable level. 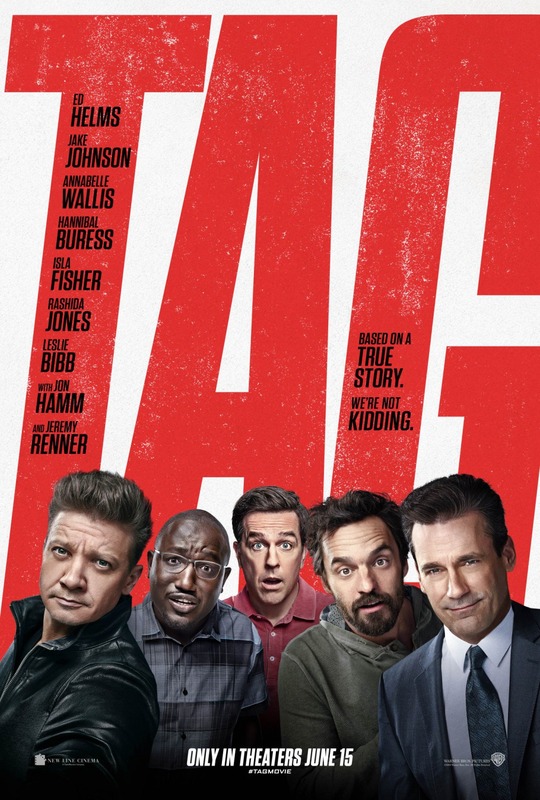 We are happy to say, we had a whole lot of fun watching "Tag." Any success the film has is accomplished by getting the audience invested in each of these characters and their unique friendship. All of the actors have great chemistry with one another, and we believe them as mates despite their obvious age differences. The game itself is a great vehicle to create numerous situations for hilarious physical comedy, especially when it is played at such extreme levels. We get to watch Jeremy Renner's Jerry outsmart and outplay his friends at every turn, using the skills and agility he picked up playing Hawkeye to his advantage. We see Hogan try and wrangle his buddies together and join forces to tag Jerry. We laugh every damn time Hannibal Buress's Sable speaks in his deadpan, dry, humorous tone of voice. We roll our eyes at the selfishness of Bob's arrogance but laugh because Hamm plays this part so well. There is also a hefty dose of witty humor to go along with the slapstick and physical comedy, all of which left us laughing pretty consistently throughout its runtime. It does follow the typical 'comedy film formula' where there is an inevitable fallout as well as an ultimate resolution, which feels a little out of place and convenient in the grand scheme of the story. There's only one major scene that winds up being super cringe-worthy since it uses an extremely sensitive subject as the basis for a long-running joke. This joke will be horrible to some, but the characters in the movie acknowledge that it is in bad taste. That being said, this one instance may be enough to trigger some audience members into not liking this film as a whole because it "goes there." The good in "Tag" far outweighs the bad for us. On the surface, it's about playing a silly schoolyard game, but at its core, it has a lot of heart. It finishes on a high note with a very sweet sentiment about staying friends and keeping the spirit of your inner child alive inside you. This is definitely worth watching at some point. Be sure to watch the end credits as well. There is one final send-off that is equal parts bizarre and humorous.